This page Male gaze is part of the male gaze series. Laura Mulvey, in her essay "Visual Pleasure and Narrative Cinema", introduced the concept of the male gaze as a symptom of power asymmetry, hypothesizing about what she called the "male gaze." The theory of the male gaze has been hugely influential in feminist film theory and in media studies. The defining characteristic of the male gaze is that the audience is forced to regard the action and characters of a text through the perspective of a heterosexual man; the camera lingers on the curves of the female body, and events which occur to women are presented largely in the context of a man's reaction to these events. The male gaze denies women agency, relegating them to the status of objects. The female reader or viewer must experience the narrative secondarily, by identification with the male. 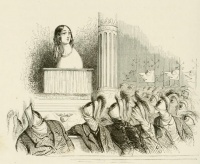 Mulvey's essay was one of the first to articulate the idea that sexism can exist not only in the content of a text, but in the way that text is presented, and in its implications about its expected audience. Some theorists also have noted the degrees to which persons are encouraged to gaze upon women in advertising, sexualizing the female body even in situations where female sexiness has nothing to do with the product being advertised. In considering the way that films are put together, many feminist film critics have pointed to the "male gaze" that predominates in classical Hollywood filmmaking. Laura Mulvey's essay "Visual Pleasure and Narrative Cinema" gave one of the most widely influential versions of this argument. 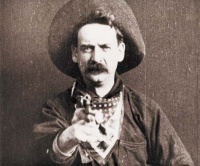 This argument holds that through the use of various film techniques, such as shot reverse shot, a typical film's viewer becomes aligned with the point of view of its male protagonist. Notably, women function as objects of this gaze far more often than as proxies for the spectator. Adam gazes at Eve in The Garden of Earthly Delights, perhaps the first instance of the male gaze in the arts. In the Renaissance, Artist and Model in the Studio by Albrecht Dürer, equates the male gaze with the invention of linear perspective. Unless indicated otherwise, the text in this article is either based on Wikipedia article "Male gaze" or another language Wikipedia page thereof used under the terms of the GNU Free Documentation License; or on original research by Jahsonic and friends. See Art and Popular Culture's copyright notice. This page was last modified 11:14, 14 July 2014.